Selecting local cleaning services would be easy if you have evaluated correctly the things you need to consider before hiring them. Yes, in this days and age, getting some house cleaning help from professionals has become a necessity, not a luxury. As a matter of fact, there are plenty of choices in hiring local cleaning services. All you need to do is to make sure that you have selected the best company that suit your needs. And to help you out, here are the things you need to ask them to make sure they offer the best service for you. 1. How long have you been in the cleaning industry? Finding out how long the cleaning company has been around in the business together with their experience as well as the length of services its employees have been with them, gives you the confidence of hiring them. Hence, a brand-new company or even an old company with all new employees may not be the best choice. 2. Do you conduct a background check to your cleaners? Local cleaning services company with reputable names were most likely to perform background checks on all of their employees. Yet, when you hire an independent cleaner, you act as their employers. And that makes you responsible for doing any background screening. A background check can ensure the safety of you and your home by allowing you to know who is entering your house. Also, they should also be able to tell you whether the same house cleaners will be sent to your house each time if ever you choose them. 3. How do you set your rates? Get a cleaning company that gives you an estimate on how long it will take to clean your house. Remember that they should give you a flat rate for each visit depending on the condition of your property’s need and how often you will need their service. 4. Is your Company Secure and Bonded? Professional cleaning services will carry liability insurance and bond with the policy in place in case something gets broken or goes missing in your house. This will provide you with security and peace of mind during the cleaning service conducted by your chosen company. You may also want to inform the cleaning service if you have any items that need special care. 5. Do you bring equipment and cleaning supplies when you do the job? Some companies provide their own cleaning equipment and supplies. However, there are also others that only provide the equipment. Thus, letting you be responsible for providing the supplies needed for the job. Also, companies nowadays can use both conventional and environment-friendly products. Therefore, just make sure to know the distinction earlier. One way to spot reliable local cleaning services is when they are open to suggestions and feedback from their customers. They should also be also able to provide you with a satisfaction guarantee in the event that their client is not happy with the particular service. Also, make sure you should able to openly communicate with them thru email or even phone call to ensure your needs for the job. 7. What services are covered in your service package? Always ask what services are included in their service package. Yet, if you’d prefer to take care of the basic day-to-day chores and you really want a cleaner to take responsibility in window cleaning service, carpet steam cleaning, or oven-fridge deep cleaning make sure to let them know as it may affect the cleaning cost. 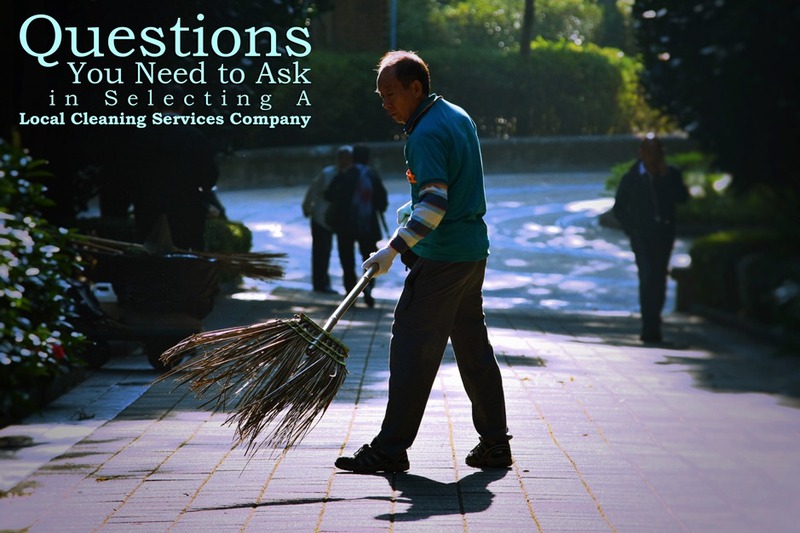 Above questions will give you clear insights into choosing the right company for your cleaning needs. Be precise in selecting the right local cleaning services. Ask the right questions and be guided by their answers. After all, their job is to bring back the feel of your house. So, it’d be best to know the basic questions before hiring them. And of course, you’re after of the quality of services they could offer to make your house clean and free from dirt. Still need more insights about cleaning? Maid in Perth is here to help. Visit our blog section and find more helpful tips for your clean-up issues and concern. Contact us directly for more details and inquiries about our services offers. And if you decide to look for local cleaning services, read this article How to Efficiently Find Local House Cleaning Services? for more useful tips. This entry was posted in House Cleaning and tagged After Party Cleaning, Apartment Cleaning, Carpet Steam Cleaning, cleaning, Commercial Cleaning, Deep Cleaning, End of Lease Cleaning, Fridge cleaning, Grout Cleaning, Home Cleaning, Move In Move Out, Oven, Spring Cleaning, Vacate Cleaning, window cleaning.